If you had an object made with precious metals such as gold, silver and platinum, would you set it up on a pedestal so that everyone in the room could see it? In fact, you've probably done that already. Those precious metals make your TV work. They are also inside your electronic devices like your computer, monitor and cell phone. But don't bother trying to "mine" your TV set. Between you and your "riches" lies a moat of chemicals, molded plastic and other hazardous materials. TVs have come a long way from the days of the tube. And that complexity is the problem. When the time comes to trade in your old set for a newer, smarter model, it's important to know what NOT to do. Fight the temptation to drop your TV by the side of the road. That is like tossing your gold, silver and platinum into the river along with those chemicals and hazardous materials. It also allows plastic to decompose and damage the environment. Don't poison the planet when there are better, easier ways to dispose of your set. Don't use it for target practice, either. Damaging an old TV set releases a toxic mess into the environment and possibly all over you, too. Your TV gave you years of use. It may not have sentimental value, but treat it with some respect. Unless you have one of those rare sets from the early days of television in the 1940s, it's a safe bet that your TV is not going to be worth more money later. There is absolutely no reason to save it for later. It just gathers dust in your closet, attic or storage facility, helping no one. On the other hand, getting rid of a heavy appliance can do you harm. You can buy a new TV, but you can't buy a new backbone. Older, heavier sets are very hard to move, especially by yourself. Is your TV "gently used" and in good working condition? If not, skip the next two sections! Be honest. Would you buy a used TV set? Most of us want a set with a warranty. But for the right price, maybe you can sell it with an ad in the paper or on eBay or Craig's List. Earth 911 notes that most smart TVs now contain personal information that you don't want to share. If you can, delete your data by performing a factory reset. Forget the gold and silver: your data is probably the most precious thing inside your set. That's one thing you'll want removed. Check your manual for directions. Can You Give It Away? Several charities accept electronic goods, which they repair and sell or even give to the needy. However, computers are far more attractive to many of them than TV sets. 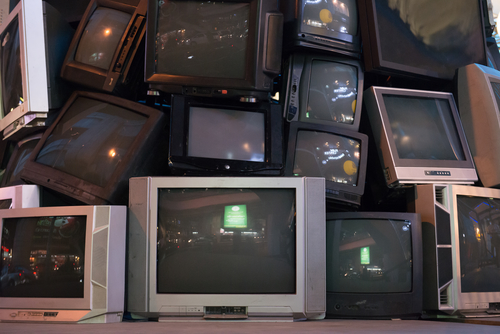 A list of national charities that accepts electronic goods can be found here, but they don't specify TV sets.The fact is, your old TV set is kind of an albatross. Can You Pay Someone to Take It? Yes, you can! Best Buy, for example, does not care what the brand is or where you purchased your old TV. When you purchase a new TV for delivery by Geek Squad or Best Busy Home Delivery, they will take away your TV or major appliance for a fee of $19.99. This offer is good throughout the United States, including Puerto Rico. Other brands offer similar services. The catch? Policies change frequently and you usually have to buy something from the brand. You'll need to check what you find online with a call. Before you get tempted to haul your set to the street or leave it in the attic, give Junk King a call. Their TV disposal and recycling program means you can recycle your old TV safely, without damage to your back or the environment. Their full-service junk removal means you can fill a bigger truck with a lot more than your old TV set. They will make sure that it's properly recycled. 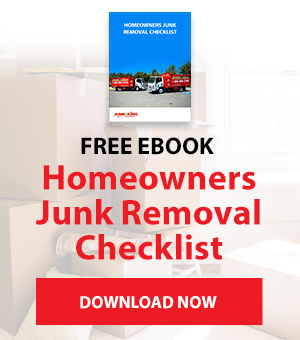 Book an appointment online or call 1-888-888-JUNK (5865) and let someone else take your problem away.